In Hear This, A.V. Club writers sing the praises of songs they know well—some inspired by a weekly theme and some not, but always songs worth hearing. This week, because there are new Coldplay and Conor Oberst records, songs we put on when we want to mope. I’ve written before about my time among the new-new wave scene around the turn of the millennium, when young twentysomethings, tired of the archness of indie rock, returned to the gloom and disaffection of post-punk—and also went to a lot of ’80s dance nights. 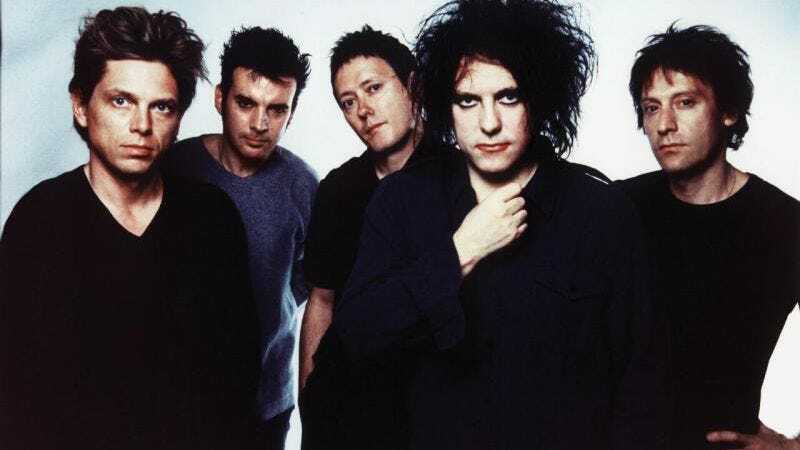 And while I was a Cure fan all through my teenage years, it was during my Sunday evenings in the dry-ice rooms of borrowed cool that “Open” most spoke to me. On those nights, my roommate had a ritual of getting ready by listening to Real Life’s cheesy synth-jam “Send Me An Angel,” a song that was all pulsing, single-man optimism. But sad, determinedly dark horse that I was, I used to put on my CD of Wish, where I let “Open” put me in the proper mindset to be the mysteriously brooding, black-clad stranger in the corner… ladies. “I really don’t know what I’m doing here / I really think I should’ve gone to bed tonight,” Robert Smith says, kicking off a description of another night spent pointlessly flirting and getting wasted to the point of collapse, and not even having any fun. Not really. As Smith finds himself amid the revelry—where he’s crushed by the hands of strangers pressing in that “won’t go away,” eventually becoming so inebriated that he’s laughing “like an animal in pain,” yet still “just looking at the floor”—he’s always aware that his outward, manic joy is just a chemically supplied mask for his inner sadness. “I can’t seem to think / Where this is / Who I am / Why I’m keeping this going,” he yelps over seasick guitars, at the song’s midpoint moment of clarity, before yowling arguably the mopiest lyric the Bard of Mope ever moped: “And the way the rain comes down hard / That’s the way I feel inside.” I don’t go to many ’80s dance nights anymore, and I’ve since (mostly) outgrown romanticizing inner torment. But even today when I hear “Open,” that’s the way I feel inside too.